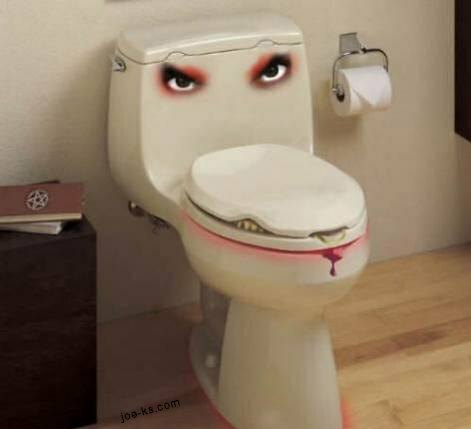 This is where everyone says "What the heck is an evil toilet doing up on your blog Val?" Well friends, that is the bane of my existence at the moment. The pentacle of my scorn. "Oh, are you sick?" you say, oh so sweetly. Nope. I am livid. At the toilet. I spent the last 4 hours working on the toilet. It required wrenches. It required sweat... eventually it required chisels because the wing nuts were rusted on to the bolts that hold the toilet on and so therefore I spent an hour with two wood chisels and a hammer, hammering through the bolts to get them off. And after replacing EVERY SINGLE BIT of the mechanics of the toilet, removing and meticulously cleaning the entire tank of the toilet inside and out, removing the crazy blue crap that was left in the tank by the previous owners, and nearly smahsing my thumb off with a hammer (did I mention the chiseling???) not to mention using every bit of my leisure nap time and more... it still doesn't flush. But... I think I am going to get out of this house and I am going to go take my kids out and do something fun. Oh how comepletely discouraging that is..